Hello! In honor of all the excitement the eastern half of our country experienced this week with their recent snowfall, I decided to post a few snowy pics of my own. As most of you know, I don't like snow, nor winter for that matter, but how could I ignore such a beautiful photo shoot opportunity like this? My outfit is as much fantasy as my love for snow. I would never wear this outfit. It's too frilly and girly for me. The skirt actually belongs to my daughter Ashley. It is one of her many thrift store finds. 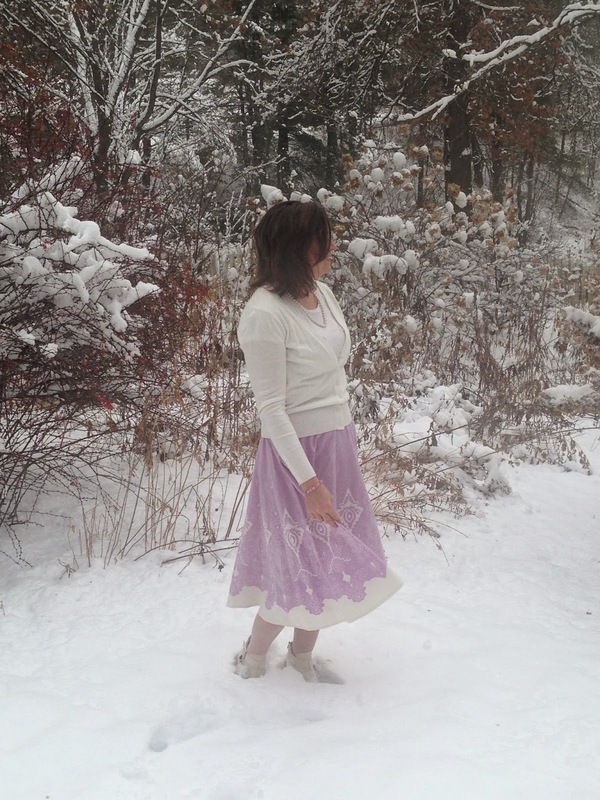 But since we were playing make-believe, I thought a make-believe outfit would go well with my make- believe love for snow. Plus, I don't want to do fashion posts of only things I would actually wear, or that would get boring really fast since I lead a very casual lifestyle. So by borrowing some clothes, and doing a few make-believe posts here and there, I mix it up a bit! "Look Ma, no feet!" LOL! We thought we had the perfect backdrop for photos, but we didn't realize that the snow was so deep that I would sink into it and look like I had no feet! Time to move to a secondary location where there is less snow. I paired Ashley's pretty skirt with my own off-white cardigan (old, from JCP), and an off-white tee shirt (old, from Old Navy). I decided to wear my cute cut out booties from Francesca's (old) to edge up the outfit a bit. I also wore off-white tights to keep my legs warm. The Old Navy tee shirt already has pretty jewels sewn sporadically throughout, so not much extra jewelry was needed. I wore just a single strand of pearls around my neck (old), and a pink beaded bracelet (old). Are you starting to notice a pattern here? I'm using the word 'old' a lot. Thats because nothing in my post is new! See dear ('dear' referring to my husband who reads my blog), I do wear my clothes more than once! JK! The skirt has a very interesting pattern on it and also some beads and sequins sewn on specific spots. So with a new thrift store find of Ashley's, I was able to create an entirely new look with old items I already had in my closet. What about you? Do you shop at thrift stores? Are you able to create a lot of fun, edgy looks with your thrift store finds? I'd love to hear from you! Your daughter sure finds most fun and unique clothes there. I love shopping at goodwill, but not usually their clothes (not enough time). A couple years ago I found the most gorgeous antique nativity pieces imported from Italy. And I found a very cute off white shabby small box that I keep on my mantle all year long and decorate around it. Sometimes it's hard to believe what people donate. What fun pictures! It's good to see you braving the cold for a little fun photoshoot! Also, great thrift findings! They're all gorgeous pieces! I love your boots and thought they made a good pairing with the skirt, which is so pretty! As of now, we have little snow here in Wisconsin so it wouldn't make a pretty backdrop like yours. Have a good weekend! What a fun outfit and perfect for your "make Believe" I love the colors...and of course you are beautiful so you would look good in anything! What a fun "fantasy outfit" idea! 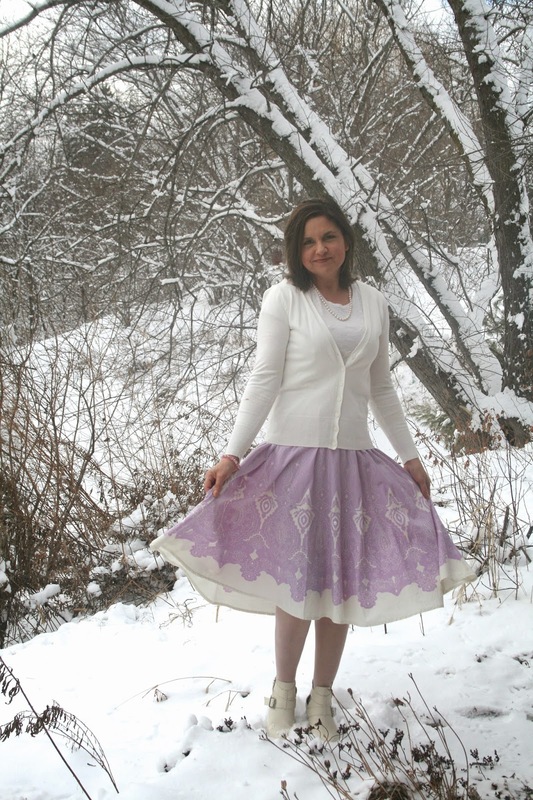 I love the lavender color of the skirt and the beautiful snowy background. I also just read your life update below! That's great that you're getting back into working out again. I used to do some FIRM workouts too! They might look a little dated but they're still effective! Oh just love this look Amy ! I'm always glad to see another fellow thrift store shopper. I love the hunt of the find and the element of surprise at what you may find. Loving your off-white booties! Thank you for sharing them on Shoe and Tell Fashion Link Up on Style Nudge! 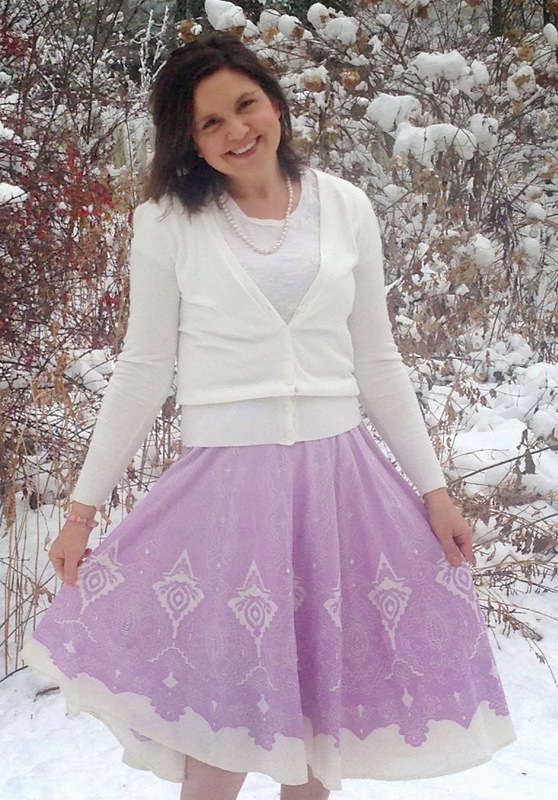 Such a fun snow outfit! Those white boots and the frilly pink skirt! Love it all! Love the retro vibe of this skirt!